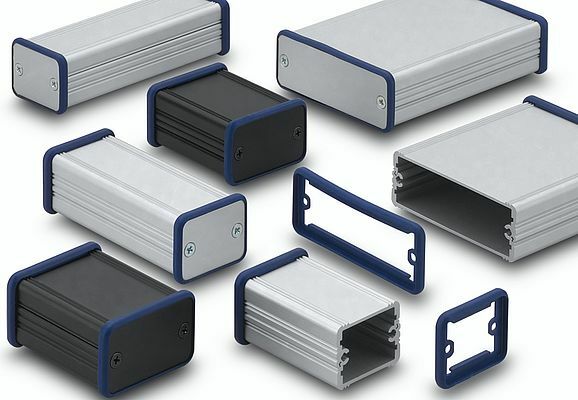 Fischer Elektronik have extended their range of practical and functional miniature aluminium casings to include a new series of miniature aluminium casings with integral seals. These well-shaped casings for a multitude of applications consist of two aluminium half shells, which, thanks to their special geometry, slot into one another to form a tube and which are fastened by means of front panels. They feature non-slip seals all around, which are at the same time design elements and these allow safe use as a desk casing for protecting the electronics. Integral guide grooves provide support for non-standard printed circuit boards or components and 100 mm-wide Euro cards. The standard version of the casing is available in three lengths (50mm, 80mm and 100mm) and two different surface finishes (natural and black anodized). In addition to the standard versions, all cases can be machined, surface-treated and printed to suit specific requirements. Besides the standard colour (cobalt blue, similar to RAL 5013), the seals can be adapted to your specific colours. Universal and efficient cooling fin case for cooling embedded mainboards. Optimally adapted heatsink solutions by means of precise milling operations. Effective heat distribution by means of pressed in copper areas in the cooling elements. Fischer Elektronik supply standard heat sinks in different sizes, designs and installation variants with short delivery times, custom millings, lot size optimized production, various surface types, special profile according to customer's demand. Fischer Elektronik offers heatsinks for the thermal management of electronic devices, cases to protect devices and PCBs against influences from the outside effectively, as well as sockets, plugs and connectors for PCBs and ribbon cables etc.